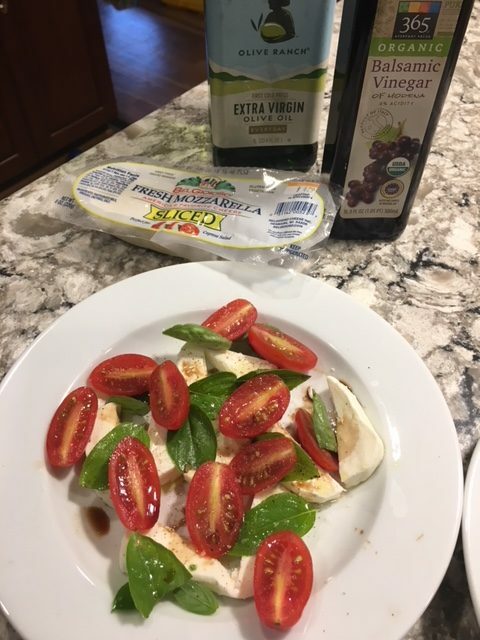 One of our favorite summer salads is a Caprese Salad. Rather than pay $10-$15 each at a nice Italian restaurant, we make them at home. In fact, we grow our own Basil in a pot on the deck. Even if you don’t grow your own Basil, the grocery stores have fresh basil all summer! Just slice any size tomato (we even used cherry tomatoes here), a few slices of fresh mozzarella, lots of basil leaves, a drizzle of olive oil and balsamic vinegar, and a sprinkle of salt and pepper. If you like the flavor of basil, but not the texture of large basil leaves, ribbon the basil (look up “how to cut basil chiffonade” online). It’s low carb! Fresh and delicious! Serve it alone as an appetizer, or as a side with grilled meat and veggies for a delicious and nutritious salad. Enjoy!